This Shelley vase is a fabulous footed vase which flares out at the top. It is from the Shelley Harmony range with banded shades of orange decorating the main body. At the top it has an unusual pattern picked out in brown which matches the foot of the vase which has also been coloured in brown. This vase dates c1925-1945 and is surprisingly small at just over 4 inches tall. It would fit into an existing Harmony Ware collection very nicely and provide an interesting contrast to the more common larger pieces of Shelley pottery. This entry was posted in New Stock and tagged Harmony ware, Shelley, Shelley China, Shelley Harmony, Shelley pottery on September 12, 2010 by Perfect Pieces. Shelley, Antiques Info & Perfect Pieces! The September / October 2008 edition of the Antiques Info magazine is now out and the main 20th Century Ceramics feature article from Roland Head in this edition looks into Shelley and the different designers that worked there. Roland looks at the work of Frederick Rhead and brothers Eric Slater and Walter Slater over the decades they worked at the Shelley factory. The article displays examples of their works and is most interesting to read. Antiques Info not only provides feature articles and information on a wide range of pottery, glass and other collectable areas but also provides a comprehensive list of fairs and auctions for the coming months. This entry was posted in Magazines, Shelley and tagged Antiques Info, Antiques Magazines, Shelley on September 6, 2008 by Perfect Pieces. What’s Designed For Children But Collected By Adults? A question with several possible answers – but in our case it’s nursery wares, in particular those made by Shelley, which form the subject of our newsletter this month. produced a surprisingly wide range of nursery wares – from commemorative pieces through to Mabel Lucie Attwell’s Boo-Boo wares with their fairyland characters. If you’re interested in Shelley or nursery wares, or would just like to see some fantastic pictures, you can take a look here. 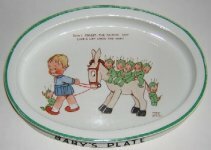 This entry was posted in Shelley and tagged Boo-Boo, commemorative, Mabel Lucie Attwell, nursery ware, Shelley on July 10, 2007 by Perfect Pieces.